For most of my childhood I can remember going on camping trips with my dad, and I remember it being so simple camping as a young man. The stories I can tell of the cold, rainy mornings huddled over coffee or being tormented after dark by my uncles are treasured. The memory of having my eyesight choked out from smoke while blowing on a fresh fire is inescapable. One thing that I can barely recall is how much crap we took with us. I’m almost certain that my dad was a minimalist camper. We probably had the smallest tent, slept on the ground in a sleeping bag, and had just what we needed to cook and eat. I remember it being a no frills trip that was enjoyable. My wife, Ashley, and I are in our ninth year of marriage this year, and before 2014 we had been on one “camping” trip. We went with my cousin and her husband in a very nice camper. It wasn’t roughing it by any means. I didn’t think she would ever enjoy sleeping in a tent being subjected to the temperature, humidity, and dew point of the outside. In October 2014, we went on a family camping trip with her mom, brother, cousin, and a bunch of our kids to Kolomoki Mounds State Park. This was Ashley’s first real taste of camping, and she loved it. The beauty of this trip was that the gear was evenly dispersed between three vehicles. Camping as a large group makes it easy to share the load, but we still packed it out to the max! The gear was a pain to get back into the house when we returned. 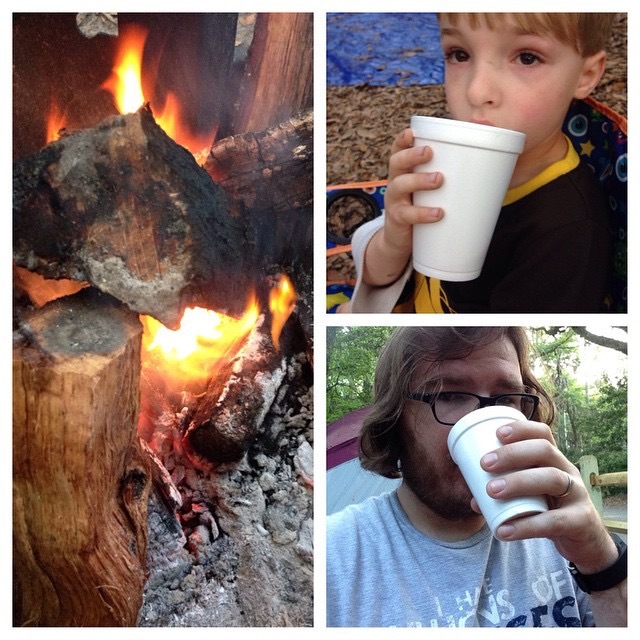 The last camping trip that we took as of this writing was to Point South KOA in South Carolina. I was able to sift through the gear and get it down to where it all fit in my Jeep Commander! I was proud of what we had accomplished, and the trip was extremely enjoyable for us. As time goes on we will get better at making sure memories happen on our camping trips. The struggle is weighing the gear versus the comfort. As each new trip is planned, I have to ask myself, “what can be left out of the box?” I don’t want to be left stranded without something, but seriously, how many times am I going to change my pants in two days, and do I really need a twenty pound tank of propane for cooking a couple of eggs on my Coleman stove? Memories are important, and having a hassle-less, pack less trip makes the moment so much more enjoyable. Following the adapted advice of Walden, reduce the amount of gear to a simple amount; “Simplify, simplify.” Cook one dish meals and take one frying pan, and “reduce other things in proportion.” What have you done to reduce your load for camping?